Diving on the colorful reefs of the Caribbean Sea, there is a number of shark and ray species you will likely encounter. Caribbean reef sharks, nurse sharks, southern stingrays, and eagle rays are the most common. If you look a little harder, you may also find hammerhead sharks, tiger sharks, lemon sharks, or bull sharks. And then there are those prominent species like whale sharks and manta rays that we all know. But the Caribbean Sea harbors dozens of intriguing shark and ray species, many of which even local inhabitants are not familiar with. Take the roughtail stingray (Bathytoshia centroura). This ray is a coastal species found over muddy and sandy sea bottoms. 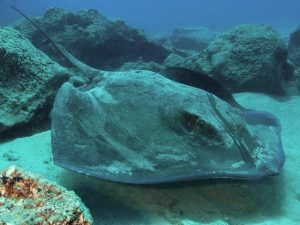 At first glance, the roughtail stingray looks very similar to the southern stingray, however, the difference is in the tail and the roughtail stingray grows a lot bigger. Its maximum size is a staggering 2,6 meters disk width. The bigeyed sixgill (Hexanchus nakamurai) shark lives near the seafloor between 90 and 600 meters depth. As its name suggests, the sixgill shark has six gills slits, whereas most other shark species only have five. 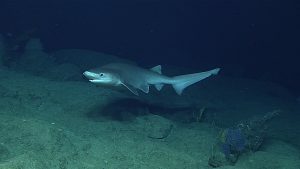 Because so little is known about the species, the IUCN has categorized the conservation status of the sixgill shark as Data Deficient. 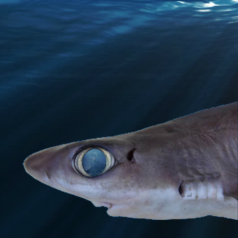 The Cuban dogfish (Squalus cubensis) is a rather small deepwater species with large eyes and spines behind its dorsal fins that resides at depths up to 380 meters. As opposed to the adults, young Cuban dogfish prefer the less deep waters of the continental and insular shelf. The Cuban dogfish is fished commercially in the northern Gulf of Mexico in trawl net fisheries. The boa catshark (Scyliorhinus boa) is one of the more enigmatic species, as there are hardly any photos of this species alive. Fisherman Nicholas Johnson from Saba took this unique picture while fishing for snapper. 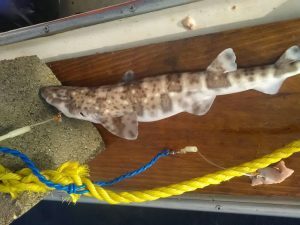 The boa catshark is a relatively small shark species that is native to the tropical western Atlantic Ocean and the Caribbean Sea. 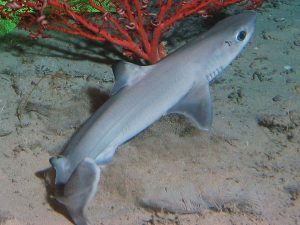 It is a deepwater shark generally occurring at depths between 300 and 700 meters. Because of its preference of the deep and because it is rarely caught in fisheries, very little is known about this species. The basking shark (Cetorhinus maximus) is a popular shark in the eastern Atlantic ocean, but few people know that the second largest fish in the world also visits the Caribbean on occasion. Although you are not likely to encounter one. Basking sharks in the Caribbean tend to stay in deeper waters for reasons still unknown to science. 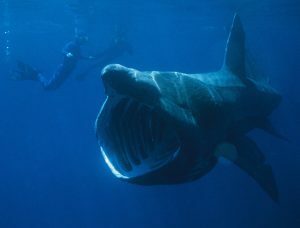 Basking sharks mainly feed on plankton by a feeding mechanism called ram feeding, in which the predator moves forward with its mouth open, engulfing the prey along with the water surrounding it. This oddly shaped ray is called the largetooth sawfish (Pristis pristis), which is closely related to another species of sawfish that occurs in the area; the smalltooth sawfish. 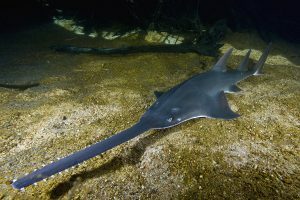 All sawfishes are categorized as critically endangered worldwide as they have suffered significant declines in all areas of their range. Sawfish are highly sought after for their valuable fins and their elongated rostrum (snout), which are sold as decorations.